Rhino Hero is more fun than it has any right to be given the simplicity of its design. We gave it three and a half stars in our review. That may not seem like much but is respectful of the fact that sometimes a game just bumps its head against the ceiling in a design space. As a dexterity game, we have to assume there will be accessibility concerns – let’s see how shaky this tower ends up being. As such, Rhino Hero is strongly recommended in this category. We’ve got more problems here. For one thing, Rhino Hero is a game that requires a degree of binocularity in vision. Placing walls and the rhino requires relatively fine precision towards the taller extremes of the tower and improper placement can result in the whole thing coming down. You can view the tower from as many angles as you like of course which limits the impact of the issue. It’s still something to bear in mind. The arrows on the cards are marked by a low contrast – roughly 1.5:1 in good lighting. That is considerably lower than we’d generally like to see here. That’s compensated by the fact the arrows are very large, but with poor visual acuity under less than optimal lighting conditions it can be something of a problem. The shiny foil that indicates special cards is highly visible, but at certain angles it might be difficult to discriminate between symbols in a similar design space. There are colour indicators, but that’s not necessarily going to be enough if there’s too much reflection or if there’s a compounding colour blindness consideration. Placement of the walls too requires players to be mindful of the disposition of the other walls in the structure. It might be necessary to slightly offset walls to deal with small but compounding mis-alignments at lower floors of the architecture. The way around you play roofs too is going to be influenced by this, and determining points of maximum pressure for other players is going to involve microanalysis at the visual level. True, this is only if you’re playing to win. If you’re in a competitive group visual impairment is going to be a serious hindrance to effective play. Of course, all of this is based on the assumption that players have some degree of visual discrimination. The game is not remotely playable in situations of near or total blindness given the fact it involves the placement of cardboard walls within tight constraints with little margin for error. This in the end is the primary accessibility concern with the game. In many ways it’s comparable to competitively building a house of cards – it’s certainly not impossible for those that are totally blind but it requires a considerable degree of extra care and attention. Within Rhino Hero, all the other players are hoping you fail and engineering the circumstances as best they can to bring that failure about. We recommend you avoid Rhino Hero if you have anything other than the most minor of visual impairments, with that recommendation becoming firmer the more pronounced impairments may be. I would have no hesitation in recommending Rhino Hero to anyone with cognitive impairments provided these impairments don’t dovetail with physical symptoms. The game stresses neither understanding nor memory. While there is a degree of strategy available for competitive players it has a highly limited impact. The back of the box claims Rhino Hero requires a considerable amount of skill, and they’re right. It’s just not skill that overlaps with cognitive faculties. The sole area that some minor complexity comes into play is in the special symbols on cards – these can alter game flow and turn order but they add minimal cognitive cost otherwise. Play can progress quite happily without these being honoured – the only cards that are really necessary for an enjoyable experience are those with the rhino symbol. You can pick and choose otherwise which symbols to incorporate and have an equally good time. In terms of memory the tower itself is all the reminder of the game state required and it’s physically present throughout the entirety of play. Assessing the tower for points of weakness may be somewhat cognitively demanding but it tends to be on a more intuitive level than would usually concern us in the teardown. Besides, not every game has to be a fraught, tense experience of furious mental evaluation. It’s fun to build up the tower and see it fall down regardless of whether you know how to maximise the chance it happens. We strongly recommend Rhino Hero in both categories of cognitive accessibility. Again, I have no real concerns here – it’s certainly possible for players to set each other up with difficult tasks but that in the end is exactly where the fun and hilarity comes from. Remember, this isn’t a game where people are trying to make a huge tower – it’s a game where everyone is trying not to be the one that makes it collapse. The collapse is inevitable, and if you cause it you’re a source of delight not frustration. This is lovely because Rhino Hero is a challenging game despite its simplicity. It needs to handle failure well, and it does it with aplomb. 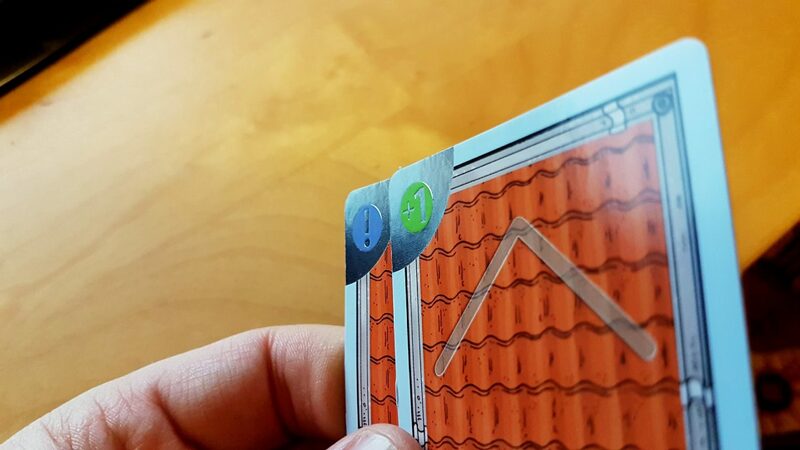 The game even comes with some ways to make especially difficult tasks rebound on the player responsible – there’s a roof that reverses the flow of play for example. If you manage to accomplish a tricky building phase, you can lay that roof down to make the even more challenging next level the responsibility of the previous player. It comes across as a shared joke, not a ‘take that’. 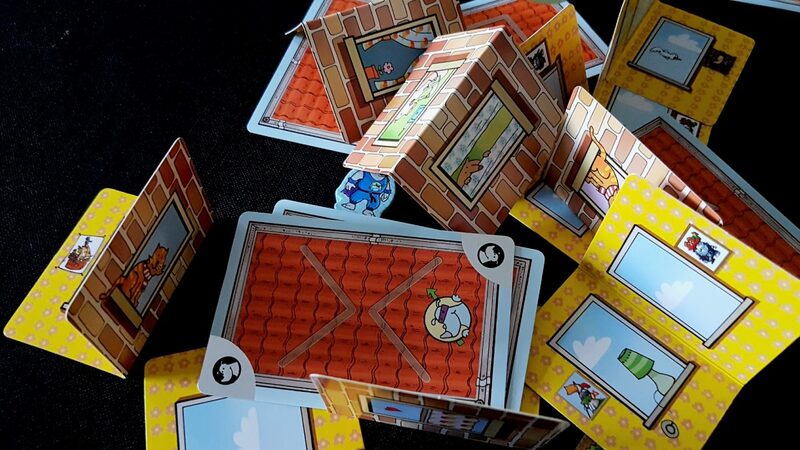 You can in many ways think of Rhino Hero as a game designed for the emotional resilience of children – that generally speaking is not especially high. Haba know how to thrive in this design space. My sole negative point here would be that it’s not always the case everyone gets an equal chance to play. There’s the aforementioned turn order reversal, and also a card that forces the next player to miss their turn. It’s possible, albeit very unlikely, that a player might end up only getting to place a single roof while everyone else gets rid of three or four. The win condition of the game is that either a player gets rid of all their cards, or they have the fewest number of cards available at the point of the tower’s collapse. That is the sole area where there might be pause for thought. Even this though isn’t going to happen very often, and it’s a five to ten minute game – if it occurs, set up once more. We have no hesitation in strongly recommending Rhino Hero in this category. This section isn’t going to be a surprise I’m sure. Rhino Hero is a game of reasonably fine positioning of walls and roofs and rhinos, and doesn’t lend itself to verbalisation. 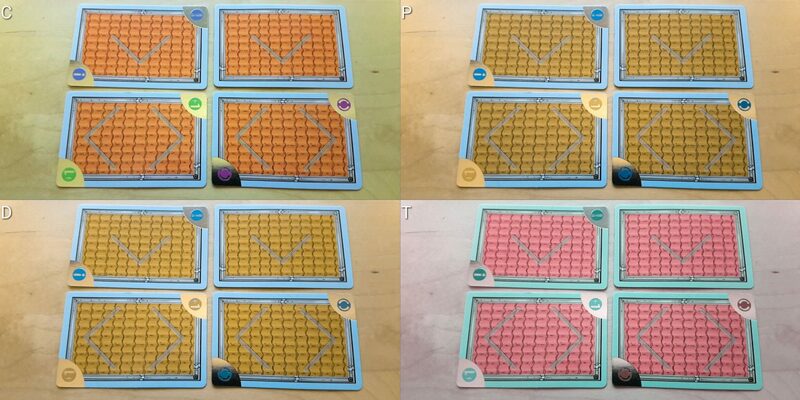 The card-play is trivial, and only sets up the context of the following placement challenge. This is a game you absolutely have to play physically to get any enjoyment. That means that those with impairments in terms of fine or gross motor skills will be unable to play. Often there is kind of dichotomy here – every impairment category we look is a multi-axis spectrum of severity and symptom and impact. The game characteristics that would stop someone with Parkinsons playing a particular game might not be a problem for someone making use of a wheelchair. However, Rhino Hero proclaims on the front of the box that it’s ‘a card game that can grow over 3 feet’. It’s not often it gets that high, but two feet isn’t unusual and one and a half is probably where the median lies. As such, if it’s not possible to stand it often won’t be possible to play at all. More than this too – it’s a game that in later stages hugely benefits from being able to orbit the table like a pool player eyeing up the ideal shot. The way the walls are built mean that sometimes there will be physical barriers that stop someone reaching in for the rhino from a particular direction. The nature of play means that sometimes you’ll need to place different walls while standing in different positions. It’s not likely to be a suitable or satisfying game regardless of what physical constraints may require accommodation. As such, our recommendation in this category is a hard fail for anything other than the most minor of impairments, and even then we’d be extremely cautious. Consider the discussion above, as ever, when assessing it for your own circumstances. There’s no reading level associated with the game, and no need for communication during play. We strongly recommend it in this category. The manual defaults to masculinity in the text which is unfortunate. However, aside from that piece of criticism there’s nothing to dislike and an awful lot to appreciate – especially the price tag. Rhino Hero often retails at less than £7 and plays well from two to five players. In fact, I don’t really see why it has to top out at all except in terms of having enough cards to keep people stocked up. In terms of sheer fun to finance, it’s outstanding value. Like Dobble it’s not going to be the cornerstone of an evening’s gaming but it will be something you consistently and continually pull out for people to play. It works well in all kinds of circumstances too – one of the rare kind of game that works just as well when sober as it does when drunk. It’s silly enough to be an easy sell and has enough meat to its mechanisms to keep everyone interested. We strongly recommend Rhino Hero in this category. There are no intersectional issues that would change the baseline category recommendation so there’s not much for us to talk about here other than our usual considerations. Game length is very brisk – ten or so minutes at the high end. It doesn’t just work for conditions with modulating severity – it’s also the kind of thing that works around brief moments of comfort. It does require a solid surface upon which to play but as long as that surface has the dimensions of a playing card you can whip this out. It extends upwards, not outwards. Even the competition in Rhino Hero is not likely to be an intersectional issue because everyone secretly wants to trigger the fail condition – it’s as fun to be the person that brings the thing collapsing to the ground as it is to be the one that watches it. As such, the hyper-competitiveness that sometimes causes intersectional problems to manifest is not a consideration. Rhino Hero is a game of accessibility extremes – when it’s accessible, it’s very accessible. When it’s not, it’s really not. Those though are fundamental limitations when working within the design space of dexterity games. Overall, this is about as accessible as you can hope such a physical game to be. It’s great to see that so many people can play it even if there are large demographics that won’t be able to give it a go. It’s not our position on Meeple Like Us that every game can feasibly be accessible to every player – just that everyone has access to great games they can play. 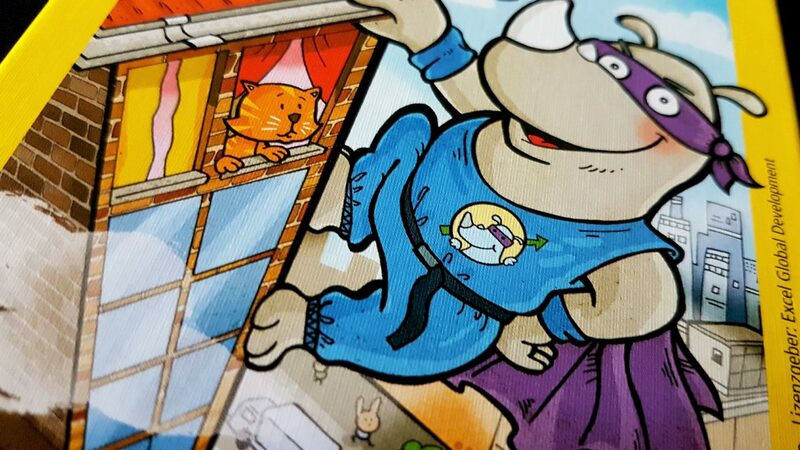 We gave Rhino Hero three and a half stars in our review – not because it has any serious flaws in its implementation but just because there’s a ceiling on how rich and interesting some games can be. If it’s a game you think you can play you have no excuses for not picking it up.